Seek and you shall eventually find. 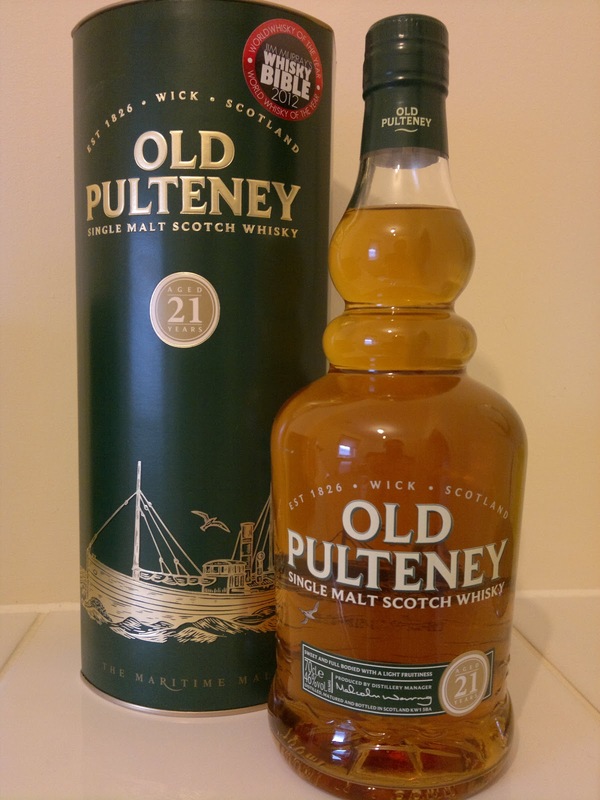 That’s been the case with the 21 year old release of Old Pulteney ever since Jim Murray awarded it the ultimate accolade of 2012 World Whisky of the Year. Stocks were immediately ransacked, making this formidable malt very elusive even in its homeland. I’m pleased to say I’ve managed to snare a bottle of this commended malt simply because I was intrigued by the hype surrounding it. I’m familiar with the 12 year edition from this distillery and it is perfectly drinkable; albeit it a little light for some (including my own) palate. 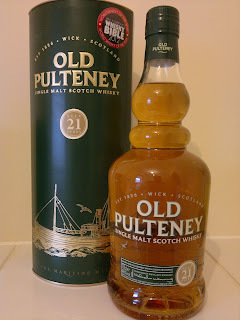 Initially I thought the 12 year old was watered down, lacking real depth of flavour and as I drank more the salty air rose from its slumber to provide some sense of finish. Yet there is still an air of disappointment here. This young malt was lacking punch and enough guts to provide a satisfying conclusion. Any suggestion of greatness was not forthcoming from this release or what lay in store. So how does it elder brother compare? Well, forget about trying comparisons as apart from the bottling and packaging these are two totally different entities. My first taste of the 21 year old malt was like an explosion within my mouth. Flavours kept on coming, rich and strong, one after another. Oh yes, this was truly something special and totally unexpected. 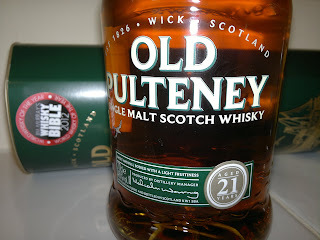 This is an Old Pulteney? What have they been doing up there all this time? A superb balance and brilliant poise with the caramel and honey interaction sending shivers down my spine. This bottle rips through some of the best malts I’ve had the pleasure of tasting including the heavyweights such as an 18 year old Highland Park. Believe me this is high praise from these quarters, and shows Jim Murray’s choice is completely warranted. 21 is the new 18 and there’s a new king in town!